Bill Rausch. Executive director of Got Your 6. Volunteer Leader with Team Red, White. Board Member at Volunteer Alexandria. Team Builder. Veterans advocate. Husband. Father. Donald Trump has ideas to fix the VA. Some have been tried before. “It sounds like to me Donald Trump needs Bob McDonald to run his Department of Veterans Affairs,” said Bill Rausch, executive director of Got Your 6, a nonprofit veteran advocate group. Full Article by Travis Tritten below. 1: Appoint new VA secretary. 2: Use “every lawful authority” to remove and discipline VA employees and managers who breach public trust. 3: Ask Congress to pass bill giving VA secretary full authority to remove anyone who risks the health or wellbeing of veterans. 4: Appoint commission to investigate VA wrongdoing and present the results to Congress as the basis for reforming the entire VA system. 5: Make sure honest and dedicated VA employees have their jobs protected. 6: 24-hour White House hotline for VA complaints. 7: Reward VA employees for saving money and improving care. 8: Make sure vets put at front of line for jobs. 9: Increase the number of VA mental health professionals, improve women’s care, and increase outreach to veterans outside the VA system. 10: Give every veteran the choice to use private health care. WASHINGTON — In late July, Donald Trump was laying out his 10-point plan to fix the Department of Veterans Affairs to a convention hall full of veterans. “This could keep me very busy at night, folks. This could take the place of Twitter,” Trump joked about one of his key proposals, a 24-hour hotline into the White House to field VA complaints. Trump said he would use the line to personally deal with unresolved complaints. That rang a bell among people following the effort to reform the country’s second largest bureaucracy over the past two years. VA Secretary Bob McDonald, fresh from his Senate confirmation in the summer of 2014, invited veterans frustrated by the VA’s troubles to call his personal cell phone for help. Trump’s hotline and a number of other initiatives in the VA plan recently unveiled by the GOP presidential nominee echo past or ongoing efforts to improve health care — including some with poor outcomes. A new secretary has been installed, laws were passed to quickly terminate bad managers and a commission completed a landmark review of the department. The VA has also hired more mental health providers, tried to protect whistleblowers and reined in employee bonuses. 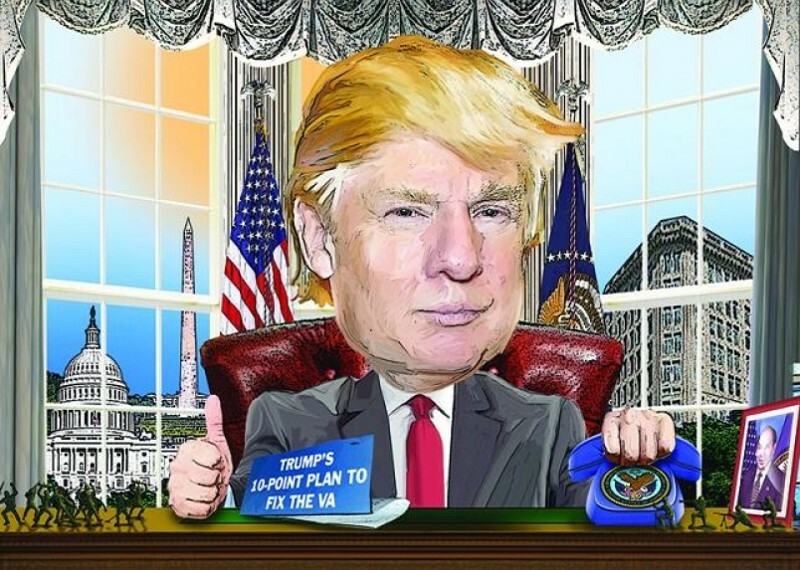 It remains unclear whether Trump’s similar approaches to VA reform will yield different or better results if he is elected president. Veterans groups said Trump has nailed the issues facing the department. Stars and Stripes looked at key proposals in the 10-point plan. Trump told a VFW convention crowd in Charlotte, N.C., on July 26 that his first initiative would be to name a new VA secretary with a “personal mission” to clean up the department. “This person, man or women, will be outstanding with an outstanding track record,” he said. Two years before Trump’s speech — almost to the day — the Senate easily confirmed McDonald with a bipartisan 97–0 vote. Many considered him to have an outstanding track record and cited his Army Ranger background and time as CEO of international powerhouse Procter & Gamble as evidence that he was best to helm the VA amid a nationwide scandal. Trump has not offered a candidate for secretary, and his campaign did not return interview requests for this story. The previous secretary, former Army Gen. Eric Shinseki, resigned in May 2014 amid revelations that the VA was hiding long and potentially dangerous waits at hospitals and clinics across the country. Shinseki said his staff also hid the manipulation from him. McDonald’s record in office has been mixed. There have been major increases in VA appointments and more than 2 million new private referrals, but the department has made little progress in reducing how long veterans wait for care. Lawmakers have often been frustrated with slow progress over the past two years, and there was public uproar over McDonald’s gaffe earlier this year comparing veteran waits for health care to lines at Disney amusement parks. Still, McDonald has maintained support among veteran groups. “He’s got a lot of energy and he’s taking the department in the right direction,” said Tom Porter, legislative director for the nonpartisan Iraq and Afghanistan Veterans of America. Soon after his confirmation in 2014, McDonald called a press conference and made a surprising move — he gave his personal cell phone number to the public and invited veterans to call him. He later said it showed that the department cared for veterans struggling to connect and get care. The VA said McDonald still maintains the cell phone — the number can be found online — and it has received 45,000 calls, texts and emails. “We believe this has been successful” in improving VA services, spokesman Randy Noller wrote in an email to Stars and Stripes. Veterans said the calls get returned, but it can take days or longer. Trump is taking a page from McDonald’s playbook by proposing a White House hotline. His VA complaint line would be staffed at all hours of the day by a “competent person” who will make sure no valid complaint is neglected, Trump said. The administration employee will answer directly to Trump, who said he will intervene directly if the job is not done correctly. It definitely could be a busy job. The VA said it employs 144 people to answer numerous hotlines that veterans can call if they need help, have problems or want to report wrongdoing. Over a million annual calls are made about benefits, suicide, combat veterans, women veterans and homeless veterans, according to the department. Even so, a recent federal audit found calls to the VA’s suicide prevention hotline often went to voicemail. Meanwhile, more than 38,000 complaints and tips were made over the past year to the VA Office of Inspector General hotline, which investigates wrongdoing in the department, according to an IG spokesman. Veterans groups interviewed by Stars and Stripes were skeptical of Trump’s hotline proposal. “Unfortunately, it is something that wouldn’t really work for him or for veterans,” said Carlos Fuentes, deputy legislative director at the VFW, which had not endorsed a presidential candidate. The next president should first work harder to consolidate the current system of hotlines, said Dan Caldwell, vice president for legislative and political action at Concerned Veterans for America, a conservative-leaning veterans group that has also not endorsed a candidate. Otherwise another phone line could just duplicate efforts and make the system more complicated, Caldwell said. “This might actually do the opposite of what it is intending to accomplish [and] add another layer of bureaucracy,” he said. Trump drew applause in July by drilling down on another top VA concern — firing executives accused of wrongdoing. He said he would use “every lawful authority” and call for new laws to make that easier, but his promise might be more complicated than it first appears. The VA and Congress have tried to do the same for two years. Their effort to root out the management culture that caused the 2014 scandal suffered a spectacular defeat in June. The department announced it was abandoning new powers that Congress created to streamline the firing of VA executives. Instead of months of appeals, the process would last just three weeks and terminated executives would not be allowed to challenge an administrative judge’s final decision. Legal experts warned two years earlier that the rules, passed in the landmark $16 billion VA overhaul law of 2014, were likely unconstitutional and violated the rights of the executives. Earlier in June, the Department of Justice finally agreed with that assessment and decided it would not defend the rules against a lawsuit by ousted hospital director Sharon Helman, who oversaw the Phoenix VA system when it was at the center of the nationwide wait-time scandal. Helman was eventually ousted for accepting gifts such as Beyonce tickets and a Disney theme park trip while working for the VA. But she is now suing over her termination. The VFW and a dozen other veteran organizations have petitioned a federal appeals court to intervene in the lawsuit in hopes of salvaging the firing rules, Fuentes said, but that might be a long shot. Concerned Veterans for America criticized the Obama administration for not backing the VA firing rules in court, saying that Trump could reverse that position. But all eyes are on Congress, which has been struggling for another solution. Lawmakers face a difficult challenge — employment rules for the 340,000 VA employees extend to employees across the federal government. Changing rules for only the VA raises problems of fairness, and changing rules for all federal employees is a much larger endeavor and heavier lift to get through Congress. Legislation in the House and Senate on firing VA employees has stalled, despite an initial scramble after the Justice Department and VA abandoned the firing rules passed in 2014. While he is firing misbehaving VA employees, Trump said he will also be investigating the department. A commission would be appointed to look into wrongdoing, and the findings would be used to reform the department, he told a gathering of the VFW. He could have been talking about the Commission on Care. The commission released its final 292-page report in July, two years after it was created by Congress through the $16 billion overhaul bill aimed at fixing the VA in 2014. It did not focus specifically on wrongdoing but performed a comprehensive review of the structure and function of the VA, and identified widespread problems in the sprawling bureaucracy. Its report included recommendations for reform, including a call for greater reliance on private health care coordinated by the department. Fuentes said the VFW would not be opposed to an investigation by Trump but it might not be necessary. “I think it is certainly time to move forward, we know what the issues are,” he said. The Commission on Care recommendations have yet to be turned into policy. That process depends on Congress and the department, and could take months or years. Trump presented his plan in a speech just days after the Commission on Care released its report advocating for the VA to use more integrated private health care. The real estate mogul said the expansion of private care for veterans would save money. Private care — long a facet of VA care — is widely supported by veterans groups as a way to reduce waits for treatment at VA facilities. “Trump said we can’t have vets waiting too long in lines … We completely agree with that,” Fuentes said. But over the past year a heated debate has broken out over how much private care the VA system should rely on and how veterans will access outside doctors and providers. Trump’s plan is mum on details that could swing support among veterans. The Commission on Care as well as groups such as VFW and IAVA prefer a veteran health care system with the VA firmly in control, referring patients to private care when appropriate. Fuentes said the VFW has worked with Trump’s staff and the GOP nominee is coming around to that point of view. On the other side of the debate, Republicans such as Sen. John McCain, R-Ariz., and Concerned Veterans for America have called for unfettered access to private care without VA coordination, such as a universal card that could be used wherever federal Medicaid insurance is accepted. Cost remains another looming issue in the private care debate — and Trump’s claim that his proposal will cost less is unlikely. The VA said it has spent over $6 billion on the Veterans Choice program, which expanded private care after the 2014 scandal to veterans who cannot get an appointment within 30 days or live more than 40 miles from a VA facility. Some veterans fear expansion could bleed resources from the VA.
“Universal or unfettered choice would cost a fortune, and it would be the wrong choice for veterans,” Porter said. From a young age I've always enjoyed cars, and reserving the Tesla Model 3 is not only exciting but also makes me feel like a kid again! When asked by folks why I'm going "electric" I explain that what excites me about the Model 3 is how groundbreaking an automobile it is. Is it electric? Absolutely, 100%. It will also clock 0-60mph in less than 6 seconds. It's American made. The base price is $35,000 and it will comfortably seat five adults with more interior room than a BMW 3-series or my current Saab 9-3. This is possible, in part, because the driving position and fronts seats have been moved forward which is not possible in a combustable front engine car (the engine is in the way). The rear seats are also pushed toward the rear of the car and with an all glass roof there is not only more headroom, the experience is said to be unforgettable. Veterans eligible for free dental care this Saturday (today)!